In the summer of 1974 I was operating a Flying Service in the northern part of West Virginia. My days were full to overflowing as I jumped between management and labor, managing when I could and flying when I was needed to fill-in for the other pilots. The charter business was booming at that time and many of my days (and nights) were spent flying businessmen and freight all over the Eastern part of the US in the Navajo, the Seneca and the Aztecs that we operated for hire. During one such trip to a small airport in the Eastern section of Pennsylvania, an ad on the office bulletin board caught my eye. "For Sale, 1937 J-2 Cub", the sign said. I owned a 1939 J-3 at the time, but I'd always been curious about the earlier Cubs that used the 40 horse power Continental engines. I inquired about it from the lady running the little airport, and she stated that it had been her deceased husband's airplane and she wanted to sell it to make room in the hangar. This was the first J-2 that I'd seen in person and I noted that it differed from the later J-3 in more ways than the engine. Rather than having the familiar sling for the rear pilot's seat, the seat sat on a plywood box that was built over the elevator bell crank. The trim cable ran along the surface of the left side of the cabin wall, looking and operating like a pulley clothesline. It had no brakes and instead of a tail wheel, it sported a tail skid. Looking back, I think it was the skid that did it. The tail skid was shared with Sophwith Camels and Curtiss Jennys' and dozens of other glorious old airplanes that had fascinated me since I was a kid. The tail skid had a certain romance about it. The tail skid captured an era that was gone. I had never owned an airplane with a tail skid. I really needed, I thought, to own this J-2. I went back to the office for a serious discussion with the lady. An agreement was struck, and a week later I came back with money. An hour after that, I clattered into the summer sky with the old girl, climbing reeeealy slooowly. I was used to the relatively spritely performance of the J-3 with one aboard, and I wondered how this airplane could ever carry two people aloft. Allegedly producing 40 horsepower, this Continental engine felt about half as powerful as the 65 horsepower power plant in the J-3. I wondered if all the horses were awake. About 30 minutes were required to reach an altitude that was comfortable for crossing the Allegheny Mountains, but once there she settled down and had a decent, if Cub-like, cruise speed. The summer landscape passed slowly beneath us and the weather remained fine and the headwinds light. At Bedford I stopped for fuel and a coke, then taxied out for take off from their short runway. When I worked for Cessna Aircraft Company, my boss Jim who was a bit of a sage told me once that you could tell by the aircraft's instruments when the pilot before you had had a close call. When I asked him how the instruments would show this, he said that the pilot's heart would have come out of his mouth and beat the glass out of them. The takeoff from Bedford probably would have proven Jim's theory if the panel had boasted many instruments. I was getting the idea that this airplane's strong suite was its uniqueness and ramp appeal, not it's flying qualities. Arriving back at home base, the airplane was a magnet that drew admirers by the dozens. Everyone that heard about it came to see it and admire its taught fabric and jaunty posture. It was a jewel I knew, but I didn't care if I ever flew it again. My J-3 was a delight to fly and it would do just about anything I asked of it, but it seemed like unrewarding toil to fly this Cub. I decided to trade it for something more fun to fly. An ad was written and sent to Trade-A-Plane, to be placed in the Swap or Trade section. Within a week the calls started to come in. Did I want to trade for a boat? A cabin on a lake? Land in the Ozarks? Could they make payments? Finally there was a response that piqued my interest. Would I consider a straight across trade for a 125 horsepower Cassutt Racer? I would, and we made plans to meet at an airport equidistant to both of us. A few days later I spotted a yellow dot on the ramp as I flew downwind at the appointed airport. I landed and as I taxied in, I got my first look at the Cassutt, crouched menacingly on the tarmac, looking like an artillery shell with wings. The owner and I introduced ourselves then circled each other's airplanes, like a couple of nineteenth century horse traders appraising the worth of the other's property. After a short while we declared mutual satisfaction with the potential trade and all that was left to do were the test flights. 'Go first', I told him, thinking that if he got the slick little racer here in one piece, he wasn't likely to wreck the Cub. He buckled in and I gave him a prop and he waddled out to the end of the runway. He was back in 20 minutes, and apparently not fazed by the 150 fpm rate of climb demonstrated by the J-2 during his (solo) demonstration flight, he climbed out of the Cub declaring himself ready to trade. Now it was my turn to fly the Cassutt. We repeated the 'brakes and contact' routine, this time with me strapped in the pilot's seat and him swinging the impressive scimitar shaped propeller. The engine caught instantly and the bark of the four short exhaust stacks surprised me. My 6 foot frame was stuffed into the confined space of the cockpit, with my head brushing the canopy and my legs stretched straight out in front of me, disappearing under a carry through spar that looked massive enough for a bridge. There were no shoulder straps, only a single belt that I couldn't seem to get tight enough to hold me securely. I taxied out, getting the feel of the tail wheel steering and brakes, and lined up on the 3000 foot runway. I was unprepared for the performance of this little rocket. With a weight of only 700 lbs the 125 horsepower gave it the approximate power/weight ratio of a World War II fighter. Before I could blink, I was off the ground and climbing at 2000 fpm. The controls had a lightness that I'd never experienced before and within seconds I knew that I wanted to do the trade. The airplane was like a trained and spirited horse that responded to your very thoughts and for the next twenty minutes I did some of the most enjoyable flying I'd ever done. I landed, and the Bills of Sale were signed and exchanged and hands were shaken. The little yellow bullet was mine. The trip home was a never ending series of rolls, as I exalted over the ease with which the airplane went around its axis. 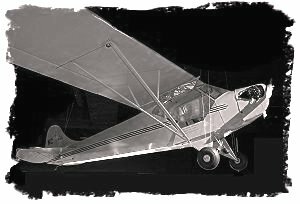 My previous aerobatic experience had been in the Luscombe, which had ailerons that felt like the stick had been set in a bucket of cement, and the Citabria, which though somewhat easier on the controls, required me bracing myself on a cabin strut to exert enough pressure for a roll. I found with the Cassutt, I could put my feet flat on the floor and just slap the stick with the flat of my hand and it would do a quick and perfect roll. I didn't know airplanes like this existed and I couldn't get enough of it. For the next week I flew the Cassutt whenever there was time, feeling out its capabilities and trying ever more difficult maneuvers. I did loops, Immelmans, Cuban Eights and eight point rolls. My confidence in the airplane grew and finally I felt I was ready to try some maneuvers that were new to me..
A vertical roll is exactly that; a roll about the airplane's axis while it is flying straight up. The vertical roll is very showy and is a maneuver that is only seen at airshows. I'd never flown an airplane with enough speed and power to do one, but I was flying such an airplane now and today, on this fine August afternoon, it was time to try one. Down went the nose and the airspeed quickly accelerated to over two hundred. I pulled the stick back and the G forces built as the nose came up, through the horizon and on up, up until the wings were exactly perpendicular to the ground and the nose exactly vertical. At that moment I pushed the stick to the right and the airplane rotated. Unfortunately at the same time I also inadvertently added a bit of forward stick and negative G force. Instantly I saw the propeller stop dead, as the fuel stopped flowing to the carburetor, the engine quit and the airplane tumbled out of the vertical plane. Without an inverted fuel system this engine would not run without positive gravity on the airplane and I had just taken that away. I needed to get the prop rotating again, or I was going to be landing directly below my present location and there wasn't an airport there. I quickly dumped the nose steeply down, trying for the pinwheel effect of the wind to start the propeller turning, and again the speed built, slower this time with the drag of the stopped propeller. 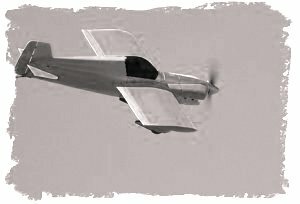 But even as the speed built, the prop didn't budge and I was quickly squandering the altitude I had. I pulled the nose back level, slowing the ship to the best glide speed and started looking with a great deal of interest for a suitable landing spot. The terrain was typical West Virginia with steep hills and narrow valleys and nowhere was there a field big enough for even a Cub, let alone the Cassutt. Then I saw that a mile to my west and 2000 feet beneath me laid I-79, its ribbon of concrete shinning in the afternoon sun. I quickly set up a pattern that would allow me to land in the south bound lane, which was a straight and level section of the highway, but once established on the approach I saw that the traffic looked too heavy in that lane to allow a safe landing. The north bound lane had much lighter traffic, so I changed directions once more, using up the rest of my excess altitude. I was now committed to a landing in the north bound lane of the interstate. This was not, I now saw, a section of the road I would have chosen for a landing if I'd had a choice. This bit of the highway ran slightly uphill, but the real problem was I'd be landing in a curve. I considered the point moot, since I was out of options, and I settled myself to the landing. Looking ahead I saw power lines crossing the road in front of me at about the height I would be when I arrived at there, given my current glide angle. Once again I dumped the nose to get below the lines, and just as they passed above me I passed over several cars, moving much faster now than normal approach speed and faster than the traffic. Now the road in front of me was vacant and as I milked my speed down for the landing I saw that my touchdown would be just where the highway went through a bridge, still in a slight uphill curve. Just before I touched, I took the airplane out of the turn I'd used to match the curve in the road and touched down in the bridge going straight. I used the width of the bridge to get the airplane solidly on the ground and once there I steered left to guide the coasting airplane around the curve. As I slowed I steered the silent little ship to the breakdown lane of the road and coasted to a stop.